I didn’t get too carried away with all the good sales going on, but I did get two things that have become staples in my wardrobe in just the short time I’ve added them. 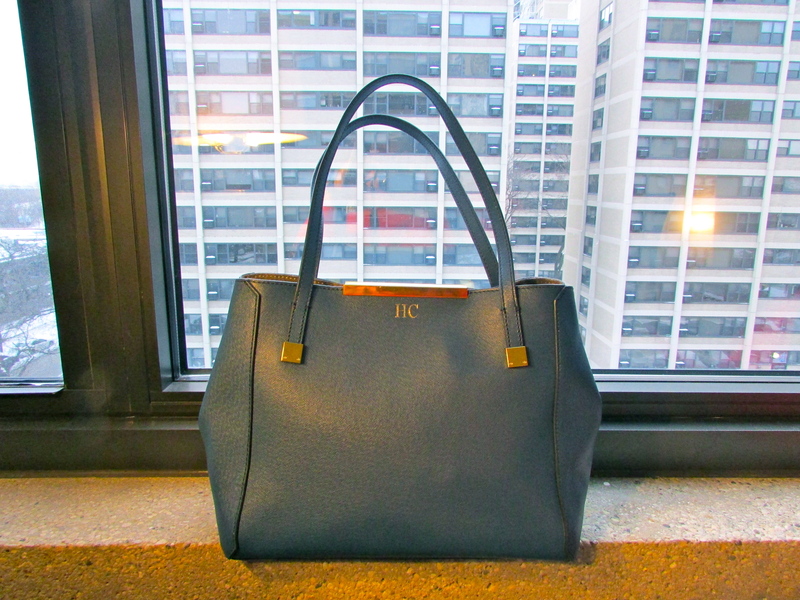 one of those purchases was this bag from J.Crew. I like the sleek lines, minimal hardware, and its durable saffiano leather exterior. the color – ‘brigade blue’ – is beautiful. not quite navy, not quite teal. just a soft, medium blue that makes me think of old world fabrics. as you can see, the color changes depending on how much light there is (apologies for the greyness of everything – blame Chicago). the inside has a durable dark grey lining along with a grey suede/raw leather trim all around the interior top edge. there are button snaps at the corners so you can cinch in the bag (like in the 1st picture) for a more demure shape or open it up (bottom 2 pictures) when you have more stuff to carry. 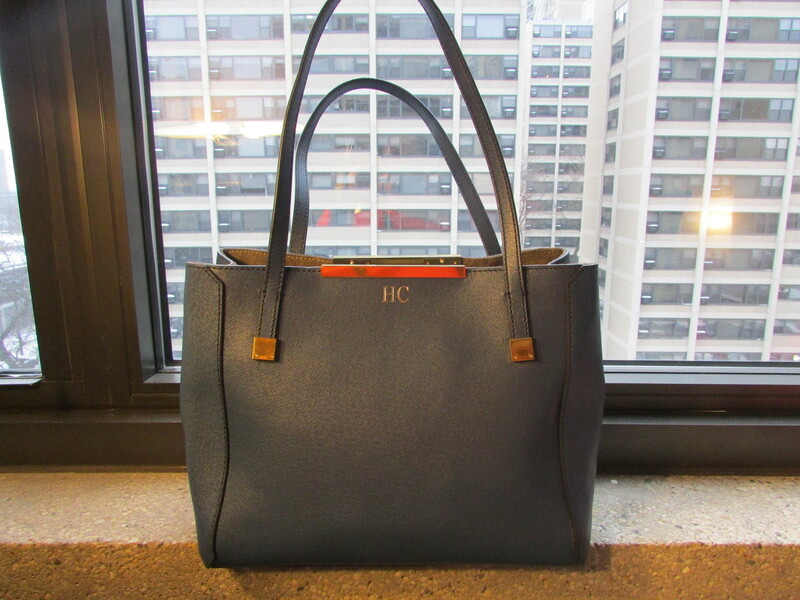 I decided to monogram it sight unseen, because it seemed like a bag whose color and shape was perfect for monogramming. 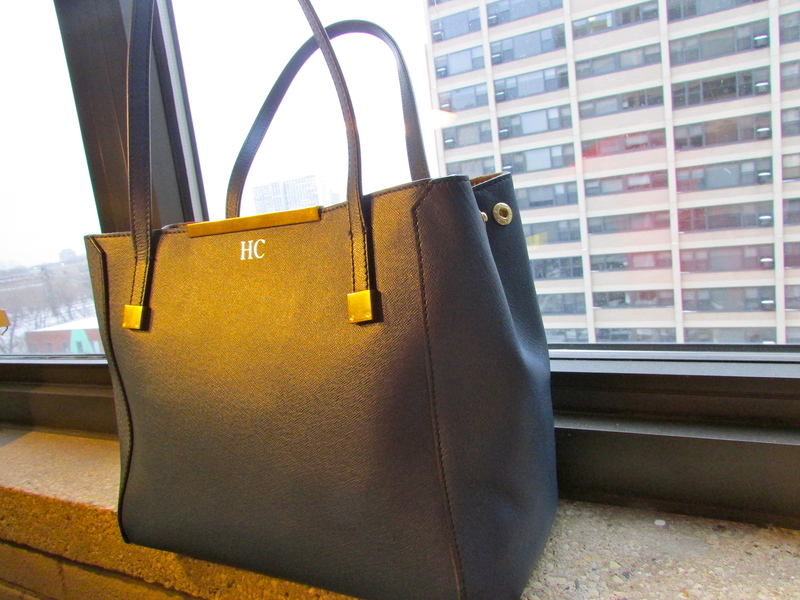 plus, I had been wanting to monogram a bag for awhile and never found the right one. it’s become a daily workhorse for me. it holds just the right amount of stuff without being too big that I’m tempted to stuff it more. it holds its shape well, I’m not worried I’ll damage it beyond repair in the snow thanks to the saffiano leather, and I can throw it over my shoulder with my puffer coat on, which is definitely a selling point in my book. there have been so many bags I’ve considered and ultimately rejected because the handles weren’t long enough for shoulder wear in the winter. since I live in Chicago where it’s winter or winter-esque ~8 months of the year, this is a deal breaker. this bag, however, passes the coat test with flying colors. if you’re looking for a stylish tote with some structure that you can use on the daily, this is a good one to consider. it’s currently 40% off the sale price of $159.99 at J.Crew, bringing this baby down to $96 + tax + $5 shipping + $6 monogramming (if you want it) = ~$115. for a good leather tote? a good buy.